If printing large 3D objects is your aim then you will be pleased to know that BigRep has this week introduced a new addition to their range in the form of the latest BigRep ONE, Version 3 3D printer. That includes a number of key upgrades and builds on the technology used on the previous versions of the. BigRep ONE. The third generation of BigRep ONE 3D printers will be available to purchase during October of this year and offer a printed volume of 1100 x 1050 x 980mm in size. At BigRep we are focusing on printing large objects reliably and fast. – The great feedback from partners and customers led to a lot of research in this field. Our new modular extruder with multiple nozzle sizes can now create objects up to 4 times faster than the old ONE.2 model. Bigger prints require much more filaments hence the new ONE can hold spools up to 10 Kg. Unfortunately no information on pricing or worldwide availability has been released as yet by BigRep, but as soon as information comes to light we will keep you updated as always. Jump over to the companies official website for more details and specifications. With its 1m³ volume, the BigRep ONE opens the gateway to a new dimension in 3D printing and 3D manufacturing. The new BigRep ONE prides itself in being the largest FFF 3D printer currently on the market, slashing the cost of a full-scale machine to one sixteenth of competitors’ market prices. 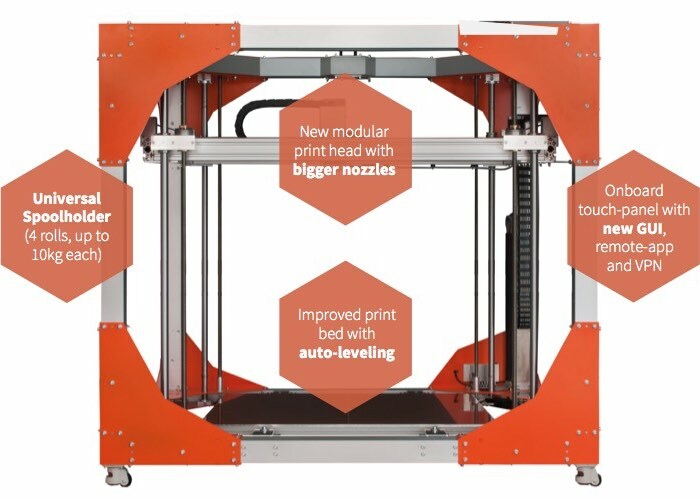 The BigRep ONE provides the Maker community with access to full scale 3D printing for a much lower price. With 27 times the volume of a large desktop 3D printer, it only costs about five times as much as the largest available desktop machine.